We're not usually into gimmicks when it comes to beauty products — you know from our Beauty Test Lab videos that some new-fangled beauty products are just not worth the hype. The one exception? Spring makeup lines, and their inevitably colorful, flower-embossed ways. When we're so sick of winter we can barely breathe (or maybe that's just a result of our seemingly never-ending sinus issues? ), seeing bright teals and soft peaches and pretty packaging just makes our hearts sing. The folks at Elizabeth Arden must have sensed that we were down in the February dumps, and they delivered with a knock-your-wool-socks-off New York In Bloom line. It includes everything from the brand's first-ever nail polishes (nifty double-ended pens that include both a color and a top coat) to the latest incarnation of its famous Green Tea fragrance (this one includes honeysuckle for the sublest hint of sweetness). The best part? Almost every product in the line is either petal-colored or adorned with sweet flowers, an adorable reminder that real buds will be springing very, very soon. In the meantime, we'll be sweeping on the shimmery, multi-shade bronzer and looking out the window for the first hints of green. Spring, we're so ready for you. 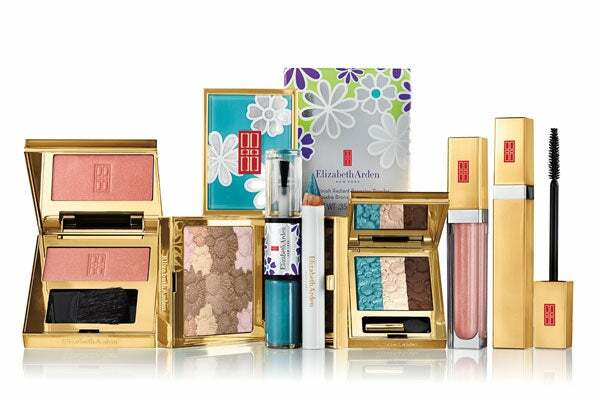 Elizabeth Arden New York In Bloom Spring/Summer 2013 Collection, $18.50-$38, available in March at Elizabeth Arden; Elizabeth Arden Green Tea Honeysuckle Eau de Toilette, $39.50, available in March at Elizabeth Arden.